Description: See, the Soo once had a healthy IM business out of the Twin Cities! Description: With the CP style "air-condo" employed, CP train #889 departs Donehower for St.Paul - yes it was HOT!!! Description: A very late running CP train #182 with a pair of Candy Apple Soo units flies thru Bangor! Description: CP train #283 approaches West Salem WI with a nice lead locomotive! Description: As a life long EMD fan - how SWEET it IS! - #283 rolls into La Crosse. Description: #283 rolls off the Black River bridge and on to French Island. Description: After meeting Amtrak #8 at River Jct. #283 heads for the Twin Cities - NICE! Description: After meeting Amtrak #8 at River Jct. #283 heads for the Twin Cities - SWEET! 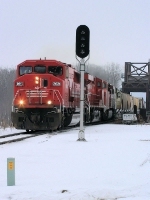 Description: CP train #280 storms into La Crosse Sunday morning - Nice leader without a doubt! Description: CP train #280 passes the Fall colors on its way to Chicago.